Democracy is best understood as an algorithm to correct political error. In that respect Democracy belongs to a special class of algorithms, with Darwinian evolution and scientific peer review as other notable members of the same class. The kinship between these disparate processes is not coincidental. The analogy can be explained in terms of Popperian epistemology, also known as the philosophy of Science, which posits the existence and mitigation of error as central to creating new knowledge. Any discussion of the process of knowledge creation may seem like a digression at this point. However, please persevere as setting this context is important for the central thesis on Democracy. Popper’s epistemology implies that any agent must create knowledge in exactly the following manner: creatively produce guesses or conjectures, and criticize them to remove those that are erroneous. Two immediate corollaries of this theory arise: a) existence of error is a permanent feature of any form of knowledge, i.e. claims of error-free knowledge (perfect revelation etc) are aphysical. b) boundless knowledge-generation must require the ability or enabling culture to make and correct error as fast as possible. we can afford many mistakes in the search. The main thing is to make them as fast as possible. The above meta-theory explains why Darwinian evolution works at all – because mutation takes the role of, as it were, guesswork and natural selection acts as the trenchant critic of those guesses, inexorably optimizing on some measure of fitness to local environment. The actual error-correction itself happens at the level of the DNA molecule, which is where the knowledge created by selection pressure is stored for all life on Earth. The same is true of the growth of scientific (or mathematical) knowledge – a result of human creativity generating the conjectures and peer-review providing the criticism. The same predictor-corrector epistemology has been formalised in various successful machine learning algorithms e.g. actor-critic reinforcement learning. In short, Popper compliance is expected of any type of knowledge creator, sentient or otherwise. Democracy is another avatar of the same underlying idea applied to politics. It does superficially look as if “Democracy” is the answer to the age-old Platonic question: who should rule? This is based on a very pervasive, but mistaken, assumption that the collective will of people is somehow sensible/rational guidance to choose a good leader. In truth, it almost never is due to very low signal-to-noise ratio. The label “Democracy” itself helps to reinforce the confusion further. Nonetheless, equating Democracy with literal rule-of-the-people is a completely mistaken and often dangerous assumption (cf. populism). Democracy works not because popular opinions are better than those of rulers, but because convincing some people of (real/imagined) shortcomings of the ruler is easy. Human beings are innately risk-averse and familiarity seeking agents. It takes very long for humans to agree what is objectively good for them, even when that good should be obvious (herein lies the root of all tyranny!). Yet in light of the epistemology described above, an “objectively good” political idea has no meaning if the bad ones weren’t tried out and discarded. We have cultural concepts of academic freedom or the freedom of speech (at least functioning in some Western societies) to generate all kinds of good/bad ideas that are then open to scrutiny and review – where both the idea generator and the reviewer agree to abjure violence when playing the actor-critic game. Democracy is the same game to try out political ideas and consign bad ones to the dustbin of history without violence. Note that the act of consigning bad ideas to some “dustbin” is not by fiat. So, binned politics can (and do) get refurbished and replayed. Nonetheless our priors about their badness are updated and their efficacy grows less with each replay (e.g. German or East European Neo-Nazism is a mere shadow of NSDAP’s politics). Also in a functioning democracy, no single person/group actually sits in judgement on what constitutes objectively good or bad politics – though some people (say populist ideologues or utopia-seekers) may think they do. The system on the whole is rigged to be more sensible than the sum of its parts. In well-designed democratic systems (more on this later) one does not even need to convince the entire population but only a fraction of it (the swing voters), and nor is good reasoning required to convince them. Emotional appeals work just as well. Such a system ensures that any leader, including the worst one (which is what really concerns us) is susceptible to swings of opinion for rational and purely emotional reasons. The better any voting system translates that swing into gain/loss of power, the better it is for hedging against downside political risk. Therefore reducing information asymmetry makes for better democracies, no matter how noisy, chaotic or opinionated people get. Where probabilities are unknowable (which is often the case in, say, political decisions), it's not the case that reason is ineffective. It merely entails a methodology very different from utility theory—among other things focused on institutional rules not individual decisions. The primary function of chosen representatives in a Democracy is not to carry out what some vaguely-defined popular will delegates to them, anymore than it is an airline pilot’s job to fly the plane on passengers’ instructions. Nonetheless, populists take the idea of the will-of-the-people seriously and are perfectly happy to crowd-source solutions to intricate questions of constitutional law and political organization via referendums. Referendums are therefore (paradoxically) antidemocratic, because they confound the whole point of the institution of seeking votes from people, namely to remove bad leaders. If their pointlessness weren’t bad enough, referendums create a terrible precedent in a parliamentary political culture to settle debates by popular voting. They encourage rank populism, incentivize escaping responsibility/blame in politicians by outsourcing important decisions to the prevailing whims and fancies of the public and diminish the historically constructive role of the Parliament. Yet, it seems that the UK is sleepwalking into another disastrous referendum to “correct” the result of the first one. This sort of unbridled populism in the UK (and the West generally) is rather frightening and can cause the unravelling of an almost thousand year old political culture with error-correction at its heart. The political spectrum/opinion can be represented on an axis, with normally distributed weights/frequencies corresponding to different intervals. So, say, -0.5 to 0.5 as Centrist, 0.5 to 1.5 as Centre-Right and 1.5 and beyond as Right and symmetrically negative intervals for the Left. Each constituency is divided into a section of voters that are ideologically corevoters, i.e. not swayed by political headwinds and those that change opinions based on political climate, i.e. swing voters. The core opinions are distributed normally across the country on the whole, yet the number of core voters varies randomly (again normally distributed) across constituencies. E.g. some constituencies are traditionally swing constituencies and others are core. The mean percentage of swing voters is a model input (set at 25% based on UK’s example). The swing in political opinion is modelled as a mean-reverting process (cf. Ornstein-Uhlenbeck process) which is a mathematical representation of a random quantity that has the property of reverting to its long-term average over some time-scale (another model input). Here the long-term mean of the swing is 0, i.e. if we wait long enough swing voters concur with core voters eventhough they may drift away in the short-term. The time-scale is generational, i.e. around 7 election time-periods. The swing happens similarly across all constituencies, i.e. all constituencies are causally aware of each other (no information asymmetry across constituencies). The swings from election-to-election can be very large or rather tame – a feature controlled by yet another volatility input to the model. I assume that the larger the swing, the more concentrated voting is around that opinion. This feature is a simplistic way to represent herd-mentality in swing voters especially when political swings are extremal. So, a swing of zero is as diffuse as core-voter political distribution (in pt 1), but a swing of 2.0 (well into Right-wing territory) implies that swing voters across constituencies will tend to vote right-wing. In mathematical terms, the variance of the swing voter distribution is narrower the larger the swing magnitude. Finally, the model is agnostic to actual truth values (assuming such an evaluation is possible at all) of political claims by Leftists or Right-wingers or, for that matter, Centrists. E.g. political centre of the 1930s Weimar Germany was well to the right of modern German politics, even by most conservative Bavarian-belt standards of today. The assumption here is that whatever the Centre may represent, its relative frequency of core support versus the fringes is a stable normalish distribution. Note that it doesn’t have to be the case and actual distributions may be rather skewed. One of the sanity checks for this toy model for me was to numerically test out Popper’s theory that a democracy with First Past the Post (FPTP) system is better designed for its political error-correction function, as opposed to systems like Proportional Representation (PR). PR cannot avoid coalitions where fringe parties still form the government (even when the mandate is against them) and can still remain in position to affect government policy by acting as king-makers. In other words, PR is not the best democratic system to remove bad leaders. Turns out the guy was making sense and my numerical experiment, at least, bears this out quite nicely. The above show simulations of how the Left, Right and Centre parties’ seats evolve across elections for Proportional Representation (PR) and First Past the Post (FPTP), where the average swing vote-share is set to 25% and the volatility is high. The results compare the final seats in 2 systems for exactly the same voting across all 500 constituencies. It is immediately obvious that under PR, no party ever gets absolute majority (>250 seats), which implies a polity hobbled with coalition politics for generations. 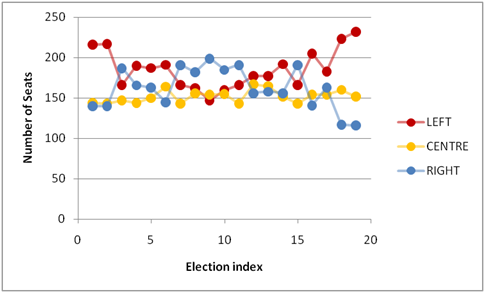 Secondly, signals from voter swings barely register in PR, as opposed to FPTP where the effect is dramatic. This is evident in the results of the last few elections, which represent a clear swing for the Left – increase of seats from 150 to over 250, whereas the Right is decimated in FPTP. The same swing is also somewhat visible in PR, but the Right still retain around 120 seats leaving lots of room for a Centre-Right coalition to form the goverment even though the mandate was to deprive the Right of power. Finally, for most elections where the swings are indecisive, the power remains well with the Centrists with full majority in FPTP, with very little need to share it with the political fringes. In sharp contrast, PR systems tend to minimize centrist power in times of high political volatility, leading to minimal seats for the centrist party in almost all simulated elections. This toy model is quite simplistic and makes some questionable assumptions. But there are a lot of ways to play around with it, not least by extending it to calibrate to real training datasets, i.e. 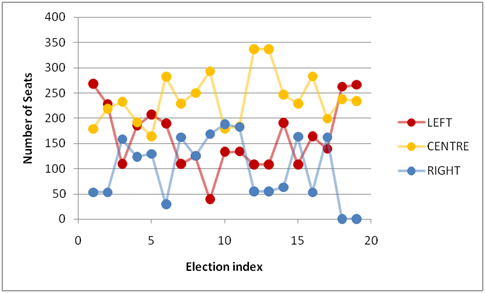 constituency-level historic voting patterns and polling data. I am even tempted to have a stab at it, as most of these data are publicly available for the UK. Not sure how much time I’ll get to devote to this. Are you sure referendums are anti-democratic ? If the essence of democracy is to try out different alternatives and hopefully converge on the good (or not so bad) then why restrict oneself to trying out leaders and not actual policies – whether good or bad ? 1) because the assumption of uniform (let alone good) access to information is a tall order for 60m people as opposed to 600.
because there is such a thing as professional expertise in argumentation and negotiation – key skills of a policy maker. because truth is not found by sampling over arbitrarily large and noisy datasets but by argument and criticism based on prior knowledge (which is sometimes experiential as much as documented). 2) Rank populism is a phrase used by all parties because there are populists in all of them. They call each other out (while doing the same themselves). This is not surprising because democracy works partly because of the shared delusion that public’s power to remove policy-makers is synonymous with informing policy. This is as patently false as the notion that removing the alpha male of a colony weeds all his genetic information out from the gene-pool. It does not, as alleles survive the individual. Slapstik, + 1008. Amazing. Wish everyone thought the way you do and developed models to make sense of patterns in data. Slapstick, I’ll read your analysis as soon as I get some time, but I just wanted to say that I thought democracy was supposed to solve the “bad leader” problem, but not the “good leader” one (i.e., it limits the harm a bad leader can do, but it provides no guarantee that a capable person will ever get into a leadership position.) I think this is what political theorists believe; IIRC Francis Fukuyama has said this. That is right. Democracy is about correcting error, i.e. removing bad leaders. It is not designed to, or meant to, be about either policy or choosing the optimal person. Corollary: a democracy that elects and then removes Trump is better designed than one that avoids Trump altogether. what if Trump removes democracy before democracy removes him? Trump seems to be trying to fulfill his promise to get the US out of its ongoing wars. If he tries too hard will he meet the same fate as JFK who tried to end the Vietnam war. Is it possible for any moderate sized or larger nonmuslim majority country to stay out of the Islamic civil war? The Islamic civil war engulfs them whether they wish it or not. Well i am not sure whether democracy even does that( removes bad leader), at least looking at India. But then “good” and “bad” has always been highly subjective terms, so there is that. In British political system and constitution, Parliament is the highest authority, not Referendums or opinion polls. The 2016 Ref was ill-thought out; the Act to go ahead with the Referendum was passed by the British Parliament with overwhelming majority , but they never thought the question , then what? The Act did not specify that the Referendum results are binding on the British Government or Parliament. If the British Parliament wants, it can decide in any way. After all the MPs have been chosen to take decisions on behalf of the people; so the Parliament should take responsibility for any decision , and not leave it to Referendum result/s. Vaguely like Princely States in India in 1947, when the decision to join India or Pakistan was left to the prince , not popular votes. The 2016 Referendum has only resulted in a Constitutional crisis and political paralysis. The Labour party has lost credibility by keeping quiet on what it’s position is on the whole matter. Apart from criticizing the HMG, it has never argued for a consistent or positive position. Corbyn’s position is ‘follow the crowd’on Brexit . After WW2, the wealth in the West made Democracy seem the norm. Equality was king so long as you were among the equals and there was wealth to spread around and a third world to do the grunt work. Think Democracy in Greece, with a world wide context. Technology (eg Internet) seemed to be the way to spread knowledge and equality. Increasing inequality, and competition by non western countries has made elites thinking of grabbing technology and media to install their “democratically” elected leader. (eg was Obama any different from Bush 2). Democracy was a illusion for wealthy western countries, that depended on cheap goods from the third world. Perhaps democracy works – if it does – thanks to it !? Well, it seems contradictory that the intent is 1) to generate as many ideas as possible and then weed out bad ones as soon as possible, 2) not to uniformly randomly sample but to use a priori knowledge. In the second you are constraining good ideas based on the definition of good by a selective set of people. Then how is it possible to generate as many ideas as possible? If democracy is like evolution, then leader election should be random lottery rather than any type of voting system. The term of election and the persons to be elected should both be random with only objective function of weeding out by some economic or well-being measure. If the measure isn’t quantitative but only ideas of people then I don’t think democracy is working strictly in Popperian Epistemology paradigm. They is no real evidence to believe that people are good at weeding out bad ideas or leaders. Also, I am at a loss to understand why FPTP with stable proportions of seats between three categories is better than PR. The whole point would be to have enough swings that no set of voters would be locked in one ideology. With FPTP system there is never any feedback loop to remove bad leaders. They have locked their voter segments ( e.g. caste politics) and are inured to actual randomness in the system. But then, what do I know anyway. Maybe the idea is to even out the noises and keep the system independent of population preference. But then I wonder how does the good ideas of governance would come about. You can have the Chinese style government that would function about the same. Or have an ever increasing proportion of voters being apathetic that means centrist samples can revert to zero but these will be decreasing number of samples. That would make variance higher in short term…? Sorry thinking out loud here. OP: Democracy is best understood as an algorithm to correct political error. Here you are starting from a premise that none of the people who were actually involved as proponents in any of the hundreds years long arguments to implement representative democracy actually held…. ‘Bold strategy’. You might want to consider instead why the people who argued for democracy did so, and the language they used. Democracy is not wisdom of crowds, it’s not some evolutionary process. It’s not about qualitatively better decision making at all. It’s an alternative to authoritarian patronage, to violent transfer of power, and to disengagement and resistance to involvement with the state and funding the state. You are closest when you talk about it being a mechanism to throw out “rulers”, not on any objective criterion of ability or decision making, but because they lack consent and legitimacy. Including when those leaders are shared institutions like the EU. A democracy that can only throw out bad individuals, but not institutional relationships which are systematically against where the majority of the people of a country wish them to be, is flawed even in the narrow terms of “error correction” (or rather “course correction”), as limited to mere tinkering around with “who” and incapable of structural course correction. Democracy is (largely) a bottom-up organized system, like say the financial markets. People involved in its organization did not have total/complete knowledge about its structure. Just as genes do not encode complete knowledge about the individual. Yet the individual does exist in a certain form as a result of Darwinian processes. And evolution is based on error-correction without any deus ex machina. Simple institutional thumb-rules can result in fairly “intelligent” emergent systems.